After three days of hacking together mount commands finally my NAS is connected so that it can be accessed from terminal. The script’s purpose is to mount a networked attached file store using terminal with the correct read and write attributes. 22:  ## The source location of the server and the share directory. 25:  ## The order is important ! 32:  ## The local directory of where the shared folder should be mounted i.e. /mnt/myshare. 36:  ## Finally the command that put's it all together with relvent read and write permissions. There is however an inherent security issue with this script as it stores passwords in plain text. 7:  #     Version      :      1. 19:  ## The source location of the server and the share directory. 22:  ## The order is important ! 29:  ## The local directory of where the shared folder should be mounted i.e. 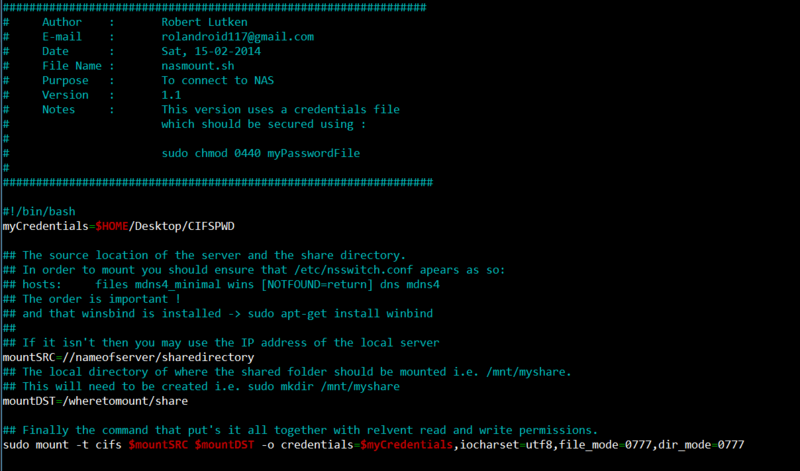 /mnt/myshare. 33:  ## Finally the command that put's it all together with relvent read and write permissions.